Martin Zwilling’s recent post discussing “10 Clues That It May Be Time To Start Your Own Business” is only partly useful. It provides a checklist of feelings or observations that, if you experience them, may help you recognize that you may be a candidate to start your own business. I’d argue that nearly everyone could look down that list and say “Aha! I should start my own business!” And perhaps you should. It would re-start the American economy like never before. However, in order to avoid a stampede to your local lawyer’s office to create your Newco, I’d like to add a few things to additionally consider. 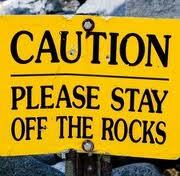 Like the sign, this blog post is merely a caution to keep you off the rocks of life. 1. Are you in the right place in your life? Dozens of entrepreneurs who’ve never started a company before in their lives show up in my office every year. After many years doing this, I can get a sense in a few minutes whether I think the founder may or may not have the pieces together to get started. One of the questions I often ask of those I’m on the fence with is “Are you in the right place in your life to do this?” In that question I’m digging into the financial and emotional support that will be necessary to carry the founder through the usually-difficult first dozen or more months of launching a technology company. You should ask yourself the same question. Do you have a spouse with a job sufficient to carry the homefront expenses reasonably? Or, do you have a pool of capital you can use to pay for the homefront expenses. Do you have 3 kids in college…or are you about to? Do you have three kids in elementary school who need to be taxi’d everywhere every day of the week? Have you explained to your spouse, honestly, the difficulty of starting a venture like this? Is he or she supportive? Does he or she understand that progress–real progress– in the business still may not produce a paycheck for you? This line of questioning can be discouraging. But I, and other investors, need to know that you’re in it for the long haul. We need to believe, and you should too, that the pressure at the business won’t be overshadowed by the pressure at home. That work-life balance we hear so much about will need to be way out of balance in the beginning. 2. Get yourself an unrelated partner. There are two reasons why I tend to stay away from investing in one-person technology ventures. The first reason is that one person, yes even you, does not know enough to succeed. You need to find a business partner who has a different base of experience and knowledge than you. Note that this should not be a person you met at a trade conference last week and you “really hit it off and see eye-to-eye on business ideas”. It needs to be someone you’ve known for quite a while and best, have worked with under fire in the past. Unfortunately for many people, this leads them to partnering with their spouse. Or sibling. Or other person they are likely to eat Thanksgiving dinner with for the next 20 years. Investors don’t want to invest in family led teams for a very good reason: they bring a lot of baggage. No…find a partner from work-world. The second reason you need a partner, in addition to nearly doubling your knowledge is that it doubles your time. The extra brain, working on solving the challenges of the business and being able to have your company present in two places at once is critical. So many entrepreneurs tell me about all the “sweat equity” they’ve invested…and often try to quantify if dollar terms. Time is like money only if you use it effectively. A smart partner helps you double this investment of time. 3. Are you resilient and resourceful? Think about times that you’ve struggled or failed at something. How did you overcome the problem? I’m telling you to look and think deeply about it. Starting this venture you’re contemplating will NOT be as easy as you’re projecting it to be. Investors want to know that you are always problem-solving. The trick to success in starting high-tech ventures is being able to find Plan B, Plan C, etc. The current term for this is “pivot”, but it is not a new concept. Are you always finding 2 and 3 ways to solve a problem? They won’t be optimal solutions, but you need some sort of options when things go wrong. You’ll need sources of emotional and intellectual support when things do go wrong…see #1 and #2 above. So take a look at the 10 clues list prepared by Zwilling. Think about taking the first step on what will undoubtedly be the most professionally and intellectually big adventure of your life. Just be sure you and those around you are prepared for all the “one step backwards” that tend to follow all the “two steps forwards”. This entry was posted in Entrepreneurial Advice and tagged entrepreneurs, founders, start-ups, VentureTips. Bookmark the permalink. These are great caveats for potential entrepreneurs – there is a lot to consider before jumping in!